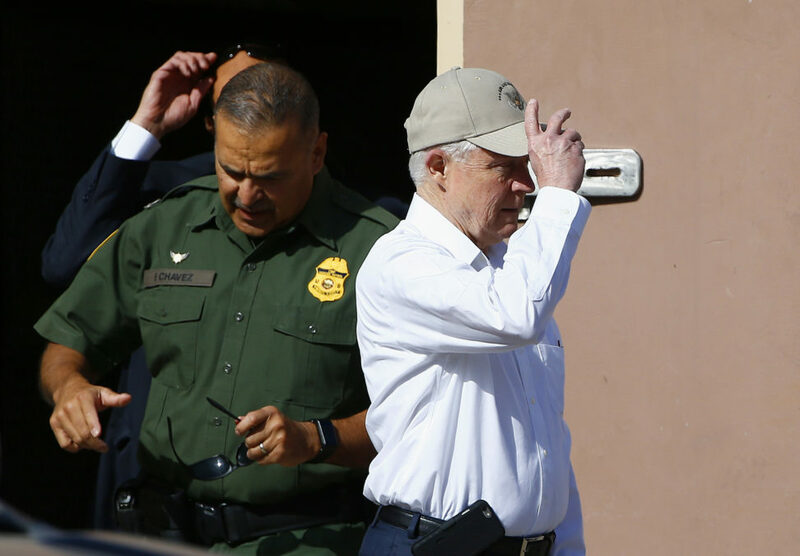 Attorney General Jeff Sessions adjusts his hat as he tours the U.S.-Mexico border with border officials in April. Sessions said Thursday that he is reviewing responses from 10 government agencies about whether they comply with federal immigration law. The Justice Department said Thursday that it is weighing whether to follow through on its threat to cut off federal grants to a handful of “sanctuary” jurisdictions across the country. The DOJ targeted 10 cities, counties and states earlier this year, demanding they justify local policies limiting their police officers’ cooperation with immigration authorities. Federal law currently bans local governments from enacting policies that prevent police and jail officials from responding to inquiries from immigration officers. The Justice Department said Thursday it received all 10 responses by the June 30 deadline it set in April. Reveal has acquired copies of eight so far. “It is not enough to assert compliance, the jurisdictions must actually be in compliance,” Attorney General Jeff Sessions said in a statement. Although the details of the local policies differ, most place some limit on holding criminal defendants in jail beyond their scheduled release date at the request of immigration authorities. Some policies bar police from answering inquiries from Immigration and Customs Enforcement during their work shifts. Philadelphia has a long-standing policy barring city employees from asking people about their citizenship status. In his letter to the Justice Department, Philadelphia City Solicitor Sozi Pedro Tulante wrote that maintaining trust between residents and police was the best way to serve its public safety interest. “Philadelphia, like most other major U.S. cities that have considered the issue, determined that policies which delicately limit information-sharing as to witnesses, victims, and persons seeking city services enhance and support its crime-fighting efforts,” Tulante wrote. Sessions presented an opposite philosophy in his statement Thursday. Sessions had been scheduled to give a speech about sanctuary cities in Philadelphia on Thursday, but canceled it on short notice. Officials in Miami-Dade County, Florida, and Clark County, Nevada, have changed their policies to begin honoring ICE detention requests, under pressure from the Trump administration. The Justice Department still required both to explain their compliance. The list also includes the state of California; the state of Connecticut; Cook County, Illinois; Milwaukee County, Wisconsin; and the cities of Chicago, New Orleans and New York. According to Justice Department spokesman Ian Prior, Connecticut wasn’t included in the Justice Department’s nine demand letters sent in April because it had already submitted its legal opinion.